DVD Synopsis: Suit up for classic comedy! 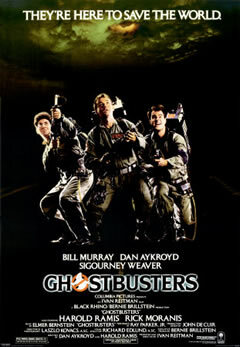 When kooky, spooky college profs Peter Venkman (Bill Murray), Ray Stantz (Dan Aykroyd) and Egon Spengler (Harold Ramis) lose their university jobs, they decide to go freelance, de-haunting houses in a new ghost removal service. As soon as they open their doors, their first order of business becomes saving beautiful cellist Dana Barrett (Sigourney Weaver) and nerdy Louis Tully (Rick Moranis), who've inadvertently opened the gates of hell... right in their own apartment building! The first time I saw Ghostbusters was during its initial run in the summer of 1984, and it’s an experience I’ll always remember. I was crammed into a packed movie house, and after every joke, sly comment, or spectral showdown this audience was howling. There was a real energy rumbling through the crowd that night, and it never seemed to pique; with each new scene, the intensity grew stronger. The combination of comedy and frights that made Ghostbusters such an enjoyable film was enough to blow people’s minds that summer evening, and I myself was so swept up by it that I begged my parents to take me back the next weekend so I could see it again. They did, and it was just as great the second time around. One of my most watched films of all time. "Ghostbusters" is not only great in many aspects of filmmaking, but it's also got that special something that propels it to a level all of it's own. I can't think of any other comedy that combines horror and sci-fi and balances it all perfectly. The cast is also one of my favorites of all time. I know Peter Venkman was everyone's favorite, but to me the number one Ghostbuster will always be Egon Spengler. Long live Harold Ramis. I also had seen that in 84 my grandfather had taken me to it. Great memories, and laughs. Always laugh when I see The GateKeeper and Key-master scenes.